Eastern facing Kradan Beach offers fine white sand and stunning views over limestone cliffs and nearby islands. Around 2 km long, a coral reef teeming with life runs the length of the beach from around 50m offshore. 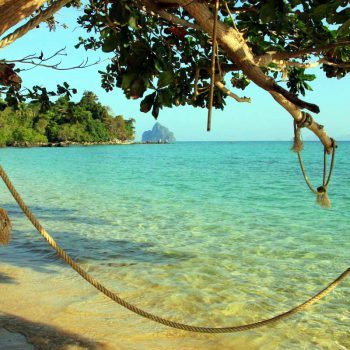 Koh Kradan Beach has stunning view over Koh Libong, Koh Whan, Koh Mook, and Koh Cherg. Swimming is excellent to the south of the beach, where the water is deep and the fine sand narrows. At low tide enjoy a stroll along sandbars at the north of the beach. Swim out to around 50m offshore to reach the coral reef. Snorkel with schools of tropic fish through stunning colourful coral. All the island’s accommodation is located on this beach. Small generators provide power and many hotels turn them off during the daytime. The Hat Chao Mai National Park campground is found at the Southern end of the beach. 200m long, secluded beach in the North of the island. Enjoy views over Koh Cherg, Koh Whan, and Koh Mook. 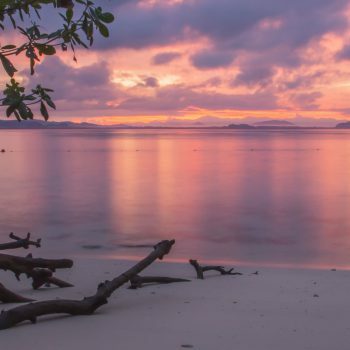 Known for spectacular sunsets, Ao Chonglom is a short walk from Kradan Beach.